Maybe it’s because I come from a different generation or maybe it’s because I’ve never cooked my family and my dog but I find inspiration in totally different ways than Rachael Ray. 19 Responses to Family/Dog Cooking – The Rachael Ray Way. Sharing and Tweeting this gem. Thanks, Bill. I think you’re only kitten us now. Where’s PETA when you need them? Clearly, that is a pre-dinner photo or it’s a stunt double dog. Exam her hot dog recipe very carefully. Do records show that she checked into Motel Hell recently or has a strange looking garden, sort of has a human quality to it, out back? What’s her favorite movie? If it’s Silence of the Lambs, I’d lock her up! I’m with you. I like your your reasoning on this. I’ve tried some of her recipes, and this explains it perfectly. And I’m missing some animals. We should talk. Ah, Bill Y, there’s nothing tastier than a slow roasted family, and a loyal dog. I’m no chef but I’ll take your word for it. Where are the grammar police when you need them? Or maybe the real police? Is that legal? The police are probably eating some sort of animal-donut recipe of hers! Jeffrey Dammer reincarnates in Rachel Ray’s kitchen. One thing I didn’t know before this is that Rachael Ray is an actual, real person. An actual, real person who is probably known for cooking? Yikes Bill Y! Yikes!!! This is why commas were invented…I hope? 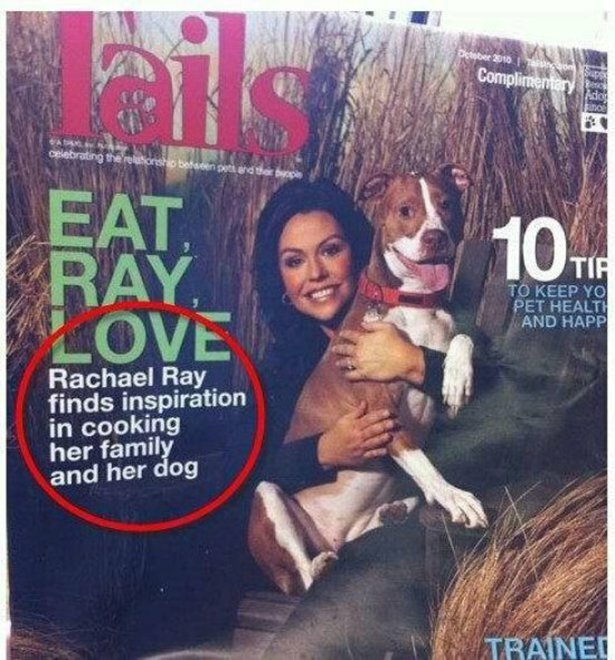 Or is there a side to Rachael Ray we don’t know about? I think it’s a lot more sinister Don Don’s. Investigative Bill Y will need to revisit this at a later date. Cooking your dog can be ruff. But cooking your family is relatively easy. P.S. As for inspiration—I know I’ll always remember cooking my mother very tenderly. You were probably only done rare.